New Traditional General Superior of the Community “Serviteurs de Jésus et de Marie"
(Paris) The Serviteurs de Jésus et de Marie (not to be confused with the Order of the Servants of Jesus and Mary founded in 1988 by Father Andreas Hönisch in the German speaking countries) have a new Superior General. The French traditionalist religious community was founded in 1930 by the priest Jean-Edouard Lamy (1853-1931). In 1909 the Virgin Mary appeared to Lamy and asked him to set up a pilgrimage to Notre-Dame des Bois near his birthplace Haute Mame. The Blessed Mother asked him also to establish an Order. The latter became possible shortly before the death of Lamy. 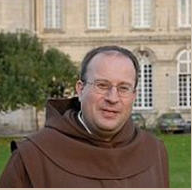 The General Chapter of the Serviteurs de Jésus et de Marie, which gathered in the abbey of Ourscamp, chose Father Laurent-Marie Picquet du Haut Jussé as the new Superior General. Father Laurent-Marie Picquet du Haut Jussé was born in 1968. In 1998 he was ordained a priest. He has a doctorate in theology from Rome and earned a licentiate in canon law. He teaches theology and canon law at various training sites for priests, including the Seminary of the Diocese of Frejus-Toulon of Bishop Dominique Rey, is a military chaplain and acts as judge in a tribunal for the Archdiocese of Paris. In 2012 he published a historical, doctrinal and spiritual introduction to the Extraordinary Form of the Roman Rite. The new Superior General in Compiegne has regularly celebrated in the traditional Rite. The members of the order of the Serviteurs de Jésus et de Marie live in a monastic community. They are active in parish ministry and have a special focus on youth apostolate. The Order has three branches, once in the ruins of the old Notre-Dame d'Ourscamp abbey, a priory in Alsace and a subsidiary in Argentina. After a slow start, the Order has begun to win postulants in the 80s and 90s under Father Thierry de Roucy (1988-2001 Superior General). A trend which will continue. Today, the community has 30 members. With the Servantes de Jésus et de Marie, a female branch has been created, the Church recognized it in 2001 by the Bishop of Beauvais. Their name as servants is modeled in their program after St. Joseph and St. John. The patron saint of the Order is the Immaculate Heart of Mary, refuge of sinners. The members of the order to follow the example of their founder Pere Lamy in following Jesus and Mary. 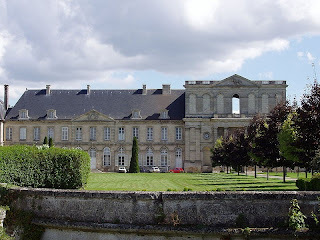 Ourscamp in Picardy is known today primarily because of its impressive monastery ruins of the former Cistercian abbey. The abbey was created in 1129 as a subsidiary founded by Saint Bernard of Clairvaux and counted in its heyday more than 500 monks. During the French Revolution the abbey government was abolished in 1792, the 102-meter monastery church was mostly raised. The monastery buildings were transferred to the possession of a revolutionary functionary, who made it his castle. In 1825 it was used as a factory. In World War I it was occupied by German troops, it burned after that as a result of Allied bombardment. Remaining is the imposing Hospital from the year 1220, and the abbot's house. In 1940 the Serviteurs de Jésus et de Marie made the monastery new again.